Are we going to get REAL action on Child Care in ND? The supply of child care in North Dakota is not meeting the need. This week, the Governor released the final report for Vision 2020 and Beyond. 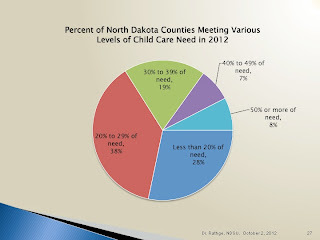 Child care is the first of only three priorities from research by the Governor and state Chamber. The Governor's budget includes $5 million. That won't go very far to serve the nearly 1,000 children on Head Start's waiting list, let alone the thousands of children whose parents need quality care so they can both feed their families and help keep the state's economic engine humming. 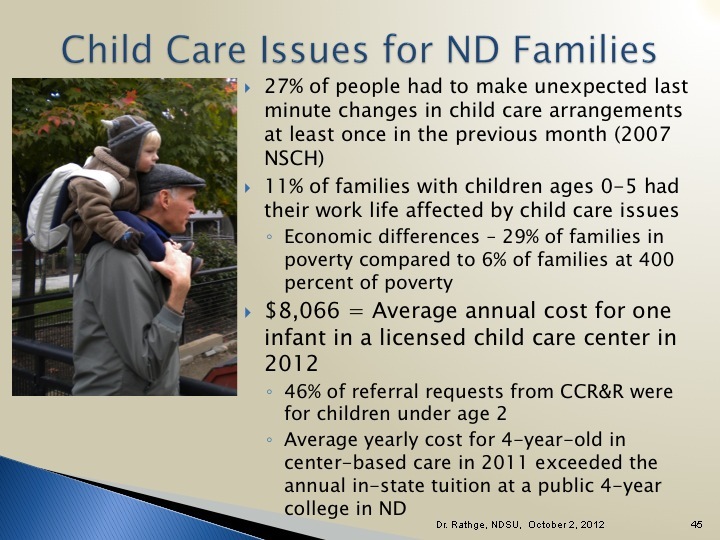 In every statewide analysis of what North Dakotans feel is important to them, the lack of childcare services has risen to the top of the list of needs. Quality, affordable childcare is necessary for the health and stability of families and a stable workforce. The governor has recommended $5 million for childcare facilities. This is a start, but the actual needs for childcare are as much as 30 TIMES that number for the ongoing costs of taking care of our children including workforce and operational support. The "business" of childcare does NOT respond to market-driven supply and demand. Taking care of our children is not like building a widget factory. 1 in 8 is 12.3% of the state's population. $22,050 annual income is $1838 per month. 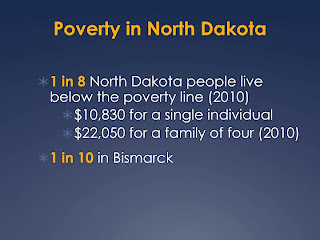 2011's poverty rate for a family of four was set at $22,350. These are poverty guidelines are set by the US Health and Human Services to determine eligibility for support programs. 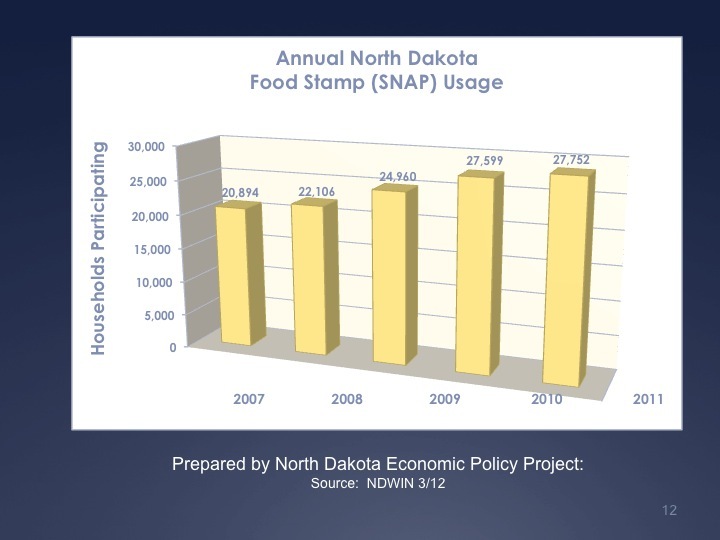 The Creating a Hunger Free North Dakota Coalition reports a 20% increase in usage of food banks in ND. 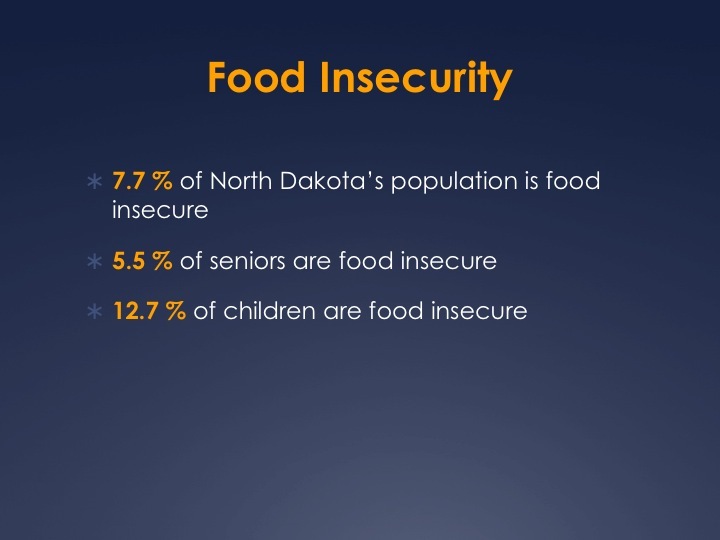 As an example, when a food bank truck visited Williams county, which boasts a 1.9% unemployment rate in the heart of oil country, 500 cars lined up for food. In addition, we are struggling with housing, particularly in the western part of the state, putting a severe strain on homeless shelters and county social services. We have seen astounding increases in rents (between 500-1000)%. 17,000 children in North Dakota lived in households where there was an uncertainty of having, or being able to get enough, food for all household members because of lack of money or other resources (2010). 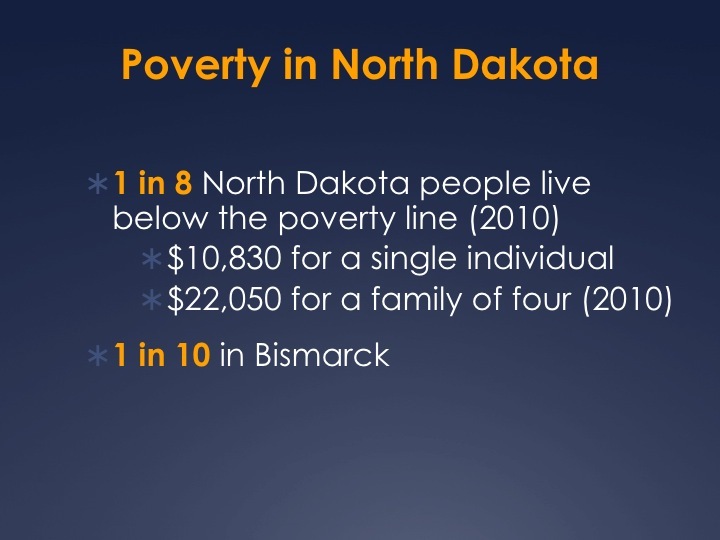 Yes, things are going well in North Dakota's economy; so well that this number should be 0.